The problem with this trainer is that it was created and compiled with CheatEngine. 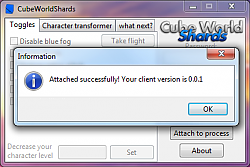 It is attaching to another process (the CubeWorld process) and manipulates it (changes some values), which of course leads to some virus scanners returning positives. 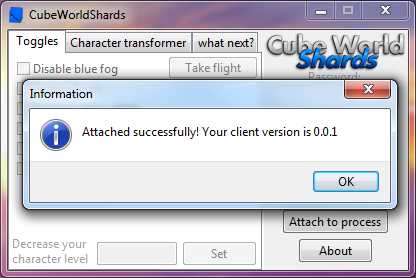 After 4 months of work my long-time project 'CubeWorldShards' is finally ready for it's first release! Riding hack: This function will restore an old glitch that allowed you to ride on ANY pet by switching the pet while sitting on a ridable pet. Beware, while for some people it may work just fine, it can lead to game crashes for others! Be very careful with this. Screenshot mode: You found a nice looking scenery and want to take a screenshot, but the GUI is ruining it? With the screenshot mode you can remove (at least some of) the GUI elements such as the corner map or the HP/MP bars. Zoom hack: Obvious name is obvious. This will allow you to zoom out as far as you want. 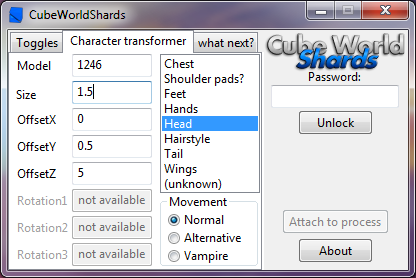 Character transformer: Allows you to rebuild your character model VISUALLY (you cannot create/modify items with it), also allowing to add stuff like wings and helmets. Movement switch: With this you can choose from 3 movement systems: Normal is the default system, alternative is an unused system I found by random and vampire is the low-gravity-like movement system that monsters with wings use. Take flight: Last but not least: the tool I am most proud of. Not just because it took forever to create but also because it's my favourite: Flying mounts. Yes, you can now fly around on a pet. And even better, you will be riding on a dragon! (video) note: You currently need to apply the model fix for the dragon manually. For the latest news you can read my changelog where I list all changes I apply to shards. If you are against cheating and dislike my project because of that, please read: The purpose of this project is to add new features to the game (like mods), NOT to give the user an unfair advantage, although some features of Shards do that. I want you guys to have fun with the game and I will never build in any functions that are solely for giving an advantage, such as an item editor or god mode. Please report any bugs you encounter while using shards. I am always open to feature requests, but please keep in mind that I can only change existing data, but cannot create entirely new features. And before you ask for quests: Here is how far I have gotten with custom quests. This is a non-profit project, there is no advertisement on my website and I do not demand any payment for my software. Please support the official game release by Picroma. That's a great mod right here, but sadly I can't figure out how I might find some good wings, btw does the transformation only change look or change the item itself ? About the time stuff: I actually made various time controls for ZirconRealms (eg a freeze timer, an option to set it manually or just completely disable it) and I am willing to do the same for all other servers that need it (unfortunately theres only PvP servers next to ZR and those can control it with cuwo). However, I am not planning to release something similar for single player until i figure out how to calculate the actual time from that hex value. There's already a guy who made a working block placement system which means he figured out how to edit the world itself (this also means he can destroy blocks). Unfortunately he disappeared before sharing it and I never figured out how it works myself. Camera and position control is something I'd never put into this trainer since it would be useless to most people, but i can give you the pointers so you can create the hotkeys yourself if that would help you. A good way is to poke around the memory viewer near the coords and rotation, it may just very well be hanging around that area. Ooh, you're already on it, nice! Well that's a shame the guy left. Never? Aw. I thought it was just a general anything goes trainer. Well maybe you can make a separate camera specific one or something. =P If you can privately give me your works that you're comfortable giving in cheat table form that would be great. Heh, I Cheat Engine offline singleplayer games all the time (I never do multiplayer unless it is with benefits to everyone - this is an example), but due to this being a multiplayer game, it's a bit harder for me to think of something "non-cheating". Hmmm, how about FOV? Also maybe making the time of day changable? I'm not entirely sure if this is possible, but perhaps server time of day as well by attaching to "server.exe". Do we know how the game detects what can and can't be blown up by bombs? It'd be interesting to be able to blow ANY ground up, not just grass and a few rocks. I've got another good one that I do for all games I hack. Camera rotation and coordinate lock (location and rotation separate). Mind you with doing this I always set hotkeys so I can manually move it around if I want too so I can get that perfect picture position. This is likely very far fetched (well hey, friendly fire attacking is apparently possible which I never thought would be! ), but do we know how the game detects what can and can't be blown up by bombs? It'd be interesting to be able to blow ANY ground up, not just grass and a few rocks. I've got another good one that I do for all games I hack. Camera rotation and coordinate lock (location and rotation separate) so the camera doesn't chase you. Mind you with doing this I always set hotkeys so I can manually move it around if I want too so I can get that perfect picture position. Last edited by Xiron : 09-05-16 at 02:36 PM. When the next version will be ready? Well, i have one idea.) Make right in trainer list of IDs of the most interesting models, for example, wings and all helmets. It'll be useful. And complete working on the friendly fire, and open it for all users, of course. And it's enough for the new version. The ID list ranges from 0 to approximately 3k and hasn't even been fully 'explored' yet. Image how much work it would be to try out and write down every single ID? Ah, so problematic... By the way, some days ago i tried to explore IDs and, it seems, i found something. I found, from which to which ID placed fist weapons. If i will call to mind it, i'll write to you. It will help in finding right models, considering the number of weapons and armor models. But it will still be difficult. And about pvp... Yes, pretty controversial question, release this option or not. I think, it worth to be released, even if it's dangerous for many players, who don't have this trainer. Judging by description, this project is really promising. And now i gonna try it! Maybe, after testing i will write my experience. 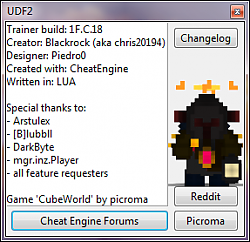 So, i played with this and i'll write: pretty interesting tool, some functions can play the role of the cheats. I like it. But i have a questions about password, unlock and transformation. 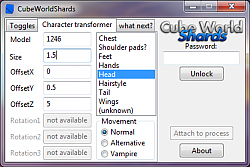 How to get this password, what can i unlock with it and why transformation don't work on my characters? 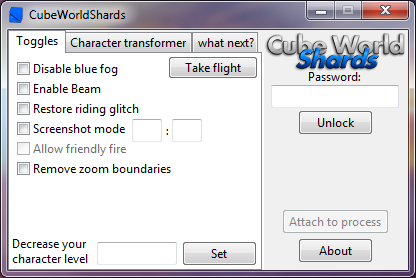 The password is locking all functions that aren't fully functionable yet (eg the friendly fire mode). I only give this password to my beta testers. 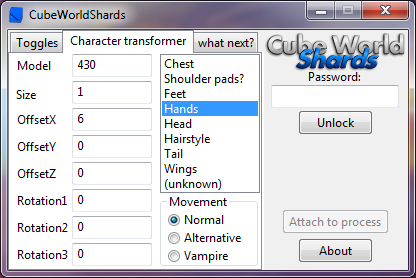 To apply the transformations you need to hit enter after typing in a value. Well, thanks for the answer. And something else. Try to add in one of the future updates function, that makes ALL mobs rideable, if character have they as a pets, for example, saurian. All I can do (and what I already did) is restoring that old glitch that allows you to do so by switching the pet while riding it. Sad. ( Then one more suggest. Few weeks ago i thought about feature, that allows spawn enemies with custom properties, for example, 10 orc warriors in the 10 blocks radius. Pretty good for massive carnage and fast level growth.) So, it would be good to make this function. Try, it's worth it. Spawning entities would mess with online servers, also I don't know how to create entities via cheat engine. Further more this would pretty much be a cheat only for the sake of its advantage, which I really dislike. Last edited by BLACKROCK : 12-25-15 at 06:37 AM. Last edited by Mighty_Demon : 12-25-15 at 05:12 AM.